It’s a dilemma many American families confront: when to ask mom or pop if they’re ready to leave their home and move into a retirement community or assisted living facility. For newer Americans, especially those from non-Western societies, the very idea often clashes with cultural expectations. That's why the success of senior living options in Seattle, Washington, specifically geared for Chinese elders, might come as a surprise. But the developers say, the demand for this housing reflects changing attitudes among Asian immigrant families about how to give and receive care in old age. Aegis Living, a for-profit senior housing chain, is investing $50 million to develop a luxury retirement community on what is now a vacant lot in a Seattle suburb. Hoping to appeal to Chinese-Americans and Chinese immigrants, Aegis Gardens, as the development will be known, will include a Zen garden, a mahjong room, multilingual nurses, "chair tai chi," a tea room, and a restaurant menu rich in Asian foods. Company founder and CEO Dwayne Clark said, for good measure, they brought in a Feng Shui consultant to review the site plans. 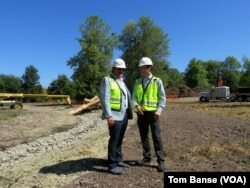 Aegis Living CEO Dwayne Clark (left) and development manager Brian Palmore at the future location of the Chinese-themed retirement home Aegis Gardens in Newcastle, Washington. Demographic research uncovered a huge market for "culturally appropriate" senior care in the Seattle area. "There's 92,000 Chinese-Americans within 25 miles. There are 30,000 within seven miles," Clark said, recalling his reaction when he learned that. "I said, 'You're kidding.' I couldn't believe that." Aegis Gardens will charge seniors $15,000 to $60,000 to move in, and monthly rents for its 100 luxury apartments will run as high as $8,000. Across Lake Washington in southeast Seattle, construction is also underway. A nonprofit called Kin On is spending about $7 million to expand its nursing home into a campus. When completed, it will provide a continuum of housing options for elderly Asian immigrants, most of whom qualify for government financial assistance. Sam Wan has been Kin On's director from the beginning, 30 years ago. The halls now echo with conversations in Cantonese and Mandarin, but Wan remembers the initial doubts about whether Chinese families would put their elders in a nursing home. "The newer immigrants would be considering having their elders stay at their home. They live together, three generations together. The nursing home phenomenon is a pretty much a Western type of culture [thing]." That pretty much describes the expectations placed on Pam Tsai and her sister. The women took in and looked after their aging mother. But when mom, who doesn't speak English, needed skilled nursing care, they turned to Kin On. "My ma, she likes Chinese food. She talks Cantonese. She likes it here," Tsai said. Because Kin On accommodates those needs, the family finds it acceptable. Across town, Aegis Living CEO Clark recalls similar conversations. "I remember meeting with this one woman who was a high-tech executive. She said, 'You know, Dwayne. I spent almost $200,000 going to Stanford getting my undergraduate degree and my MBA. I don't know that I want to stay at home taking care of my mother-in-law. I want to put my MBA to work.' She said, 'I think this is an idea whose time has come.'" The challenge for developers of these new communities is to make living in their facility better than staying at home. They join other "culturally competent" assisted living or retirement homes for Asian seniors in the city, including Seattle Keiro, which opened in 1976 for Japanese elders, and the pan-Asian Legacy House, operating since 1998. Although the Pacific Northwest is home to a large Asian community, it was not always so welcoming. Clark explains that his wife's grandfather was a Chinese-American longshoreman in Seattle, who in the family lore famously won a salmon derby in the 1940's, but was denied the top prize because of his ethnicity. But the area's reputation is so much improved that the Aegis Gardens developer anticipates the facility could become a "destination" retirement location. "I think we're going to have a great amount of people come from China," as well as closer locations with large Chinese populations such as Portland and Vancouver, Canada, he predicted.